All March long, we’re going to give you fun recipes to make some of your favorite comfort foods. This week, we’ve got recipes to make your favorite foods as healthy takeout at home. First up is a Vegetable Lo Mein for Meatless Monday that is so hearty you won’t miss the meat. These Cuban Fish Tacos with Citrus Mango Slaw and Chipotle Lime Crema will bring summer to your home early. Cuban Fish Tacos with Citrus Mango Slaw + Chipotle Lime Crema. This Skinny Honey Lemon Chicken is a quick and delicious weeknight meal. Satisfy your takeout craving with this Smoky Pork Stir-Fry at just 165 calories a serving. 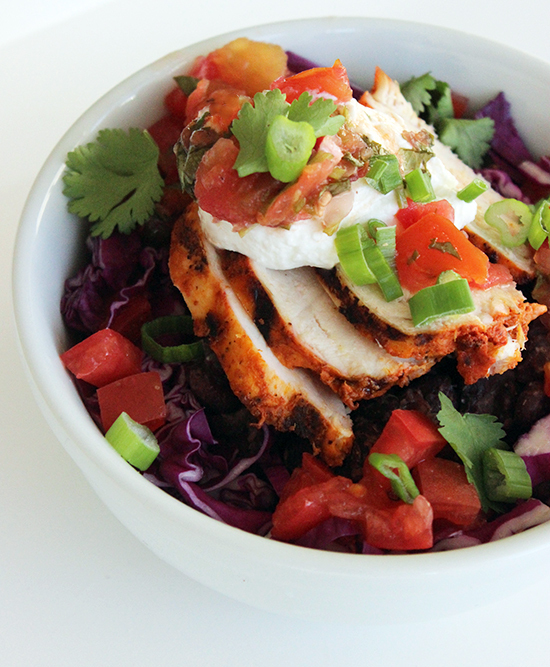 If you’re obsessed with Chipotle, this fresh, simple 350-Calorie Burrito Bowl is perfect for you. If you’re afraid of rolling your own eggrolls or sushi, this recipe for Cucumber and Avocado Summer Rolls with Mustard-Soy Sauce is an easy appetizer to master first.